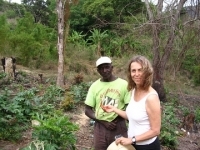 (Ph.D., UC Berkeley, 1986) conducts fieldwork on Africa and the African food legacy in the Americas. She teaches courses on African ecology and development, the African diaspora, Atlantic environmental history, food and the environment. Ph.D. in Geography, University of California, Berkeley 1986. 2012 Robert McC. Netting Award in recognition of distinguished research and professional activities that bridge geography and anthropology, Association of American Geographers. 2012 Carl O. Sauer Distinguished Scholarship Award, Conference of Latin Americanist Geographers, Association of American Geographers. 2010 Frederick Douglass Book Prize, Gilda Lehrman Center for the Study of Slavery, Resistance, and Abolition, for In the Shadow of Slavery: Africa's Botanical Legacy in the Atlantic World (University of California Press, 2009). 2003 James M. Blaut Publication Award, Association of American Geographers for Black Rice: The African Origins of Rice Cultivation in the Americas (Harvard University Press, 2001). A. Fent; R. Bardou; J. Carney; K. Cavanaugh. Transborder Political Ecology of Mangroves in Senegal and The Gambia, Global Environmental Change (forthcoming). J. Carney. Shellfish Collection in Senegambian Mangroves: A Female Knowledge System in a Priority Conservation Region, Ethnobiology 37, no.3 (2017)::440-57.
in press K.S. Zimmerer and J. Carney. How do Demographic Change and Spatial Interaction Interact with Agrobiodiversity? in Karl S. Zimmerer and Stef de Haan (eds.) Agrobiodiversity in the 21st Century. Strüngmann Forum Reports, vol. 24, J. Lupp, series editor. (Cambridge, MA: MIT Press) (2018). J. Carney. ‘The Mangrove Preserves Life’: Habitat of African survival in the Atlantic World, Geographical Review 107 (4):1-19. (Published online in early view August 4, 2016). DOI:10:1111/j.1931-0846.2016.12205.x. T.R. van Andel; R.S. Meyer; S.A. Aflitos; J.A. Carney; M.A. Veltman; D. Copetti; J.M. Flowers; R.M. Havinga; H. Maat; M.D. Purugganan; R.A. Wing; E. Schranz. Tracing ancestor rice of Suriname Maroons traced back to its African origin, Nature Plants 2, article number: 16149, 3 Oct. 2016: 1-5. doi:10.1038/nplants.2016.149. J. Carney. Between Land and Sea: Mangroves and Mollusks along Brazil’s Mangal Coast, Fronteiras: Journal of Social, Technological and Environmental Science 5, no. 3 (2016):17-38. .K. Zimmerer; J. Carney; S. Vanek. Sustainable smallholder intensification in global change? Pivotal spatial interactions, gendered livelihoods, and agrobiodiversity, Current Opinion in Environment and Sustainability 14 (2015): 49-60. J. Carney and H. Rangan. Situating African Agency in Environmental History, Environment and History 21, no.1 (2015): 1-11. H. Rangan; E. Alpers; T. Denham; C. Kull; J. Carney. Food Traditions and Landscape Histories of the Indian Ocean World: Theoretical and Metholodigical Reflections, Environment and History 21, no.1 (2015): 135-157. J. Carney. The Columbian Exchange, in Joseph C. Miller (ed.) Princeton Companion to Atlantic History (Princeton: Princeton University Press, forthcoming 2015). J. Carney and Marlène Elias. Gendered Knowledge and the African Shea-Nut Tree, in Susanna Hecht, Kathleen Morrison, Christine Padoch (eds.) The Social Lives of Forests: Past, Present, and Future of Woodland Resurgence (Chicago: University of Chicago Press, 2014), pp. 231-238. J. Carney. Fields of Survival, Foods of Memory, in Rachel Slocum and Arun Saldanha (eds. ), Geographies of Race and Food: Fields, Bodies, Markets (Surrey, UK: Ashgate, 2013), pp. 61-78. M. Wang; Y. Yu; G. Haberer; P. Marri; C. Fan; J.L. Goicoechea; A. Zuccolo; X. Song; D. Kudrna; S.S.A. Jetty; R.M. Cossu; C. Maldonado; J. Chen; S. Lee; N.Sisneros; K. de Baynast; W. Golser; M. Wissotski; W. Kim; P. Sanchez; M.-N. Ndjiondjop; K. Sanni; M. Long; J. Carney; O. Panaud; T. Wicker; C. Machado; M. Chen; K.F.X. Mayer; S. Rounsley; R.A. Wing. The genome sequence of African rice (Oryza glaberrima) and evidence for independent domestication, Nature Genetics 46, no.9, (2014): 982-988. J. Carney, T. Gillespie; R. Rosomoff. The Changing Pattern of Mangrove Forest Coverage in Senegambia: 1986-2010, Geoforum, 53 (2014): 126-35. J. Carney. African Plant and Animal Species in Eighteenth-Century Tropical America, in Veronika Hyden-Hanscho; Renate Piper; Werner Stangl (eds.) Cultural Exchange and Consumption Patterns in the Age of Enlightenment Europe and the Atlantic World (Bochum: Winkler Verlag, 2013), pp. 97-115. H. Rangan, J. Carney, and T. Denham. Environmental History of Botanical Exchanges in the Indian Ocean World, Environment and History, 18, no.3 (2012): 311-342. B. Crow and J. Carney. Commercializing Nature: Mangrove Conservation and Female Oyster Collectors in The Gambia, Antipode, 45 (2) (2013): 275-293. J. Carney. "Landscapes and Places of Memory: African Diaspora Research and Geography," in Tejumola Olaniyan and James H. Sweet (eds. ), The African Diaspora and the Disciplines (Bloomington: Indiana University Press, 2010), pp.101-118. J. Carney. Navegando Contra a Corrente: O Papel dos Escravos e da Flora Africana na Botânica do Período Colonial, África: Revista do Centro de Estudos Africanos, 22/23, no. 1 [1999-2001] (2004): 25-47. J. Carney and R. Acevedo Marin. Aportes dos escravos na história do cultivo do arroz africano nas Américas, Estudos Sociedade e Agricultura, 12 (1999): 113-133. J. Carney. The Role of African Rice and Slaves in the History of Rice Cultivation in the Americas, Human Ecology, 26, no.4: (1998): 525-545.